The holidays magnify our pain and grief. In the past few months we’ve experienced the deadliest mass shooting in U.S. history and major hurricanes whereby people have lost everything they’ve worked their entire life to attain. Most of us are overwhelmed and exhausted and it doesn’t seem to be getting better when you look at the news. Grief. Pain. Helplessness. Sadness and Darkness. Deep and overwhelming. Seemingly never ending. Who wants it? Who needs it? Often, we associate grieving with the loss of a loved one through death or divorce. Of course, death and divorce are devastating. But grieving is what gets us through the devastation of the “Hurricane Harvey’s;” moving away from friends and family and the aftermath of losing when the “win” seemed so certain. It serves us during the in-between times like waiting to see if we got the job, praying the lost pet returns or waiting for the doctor’s test. Grief is in a lifetime of sorrow watching your child battle a condition that robs them of their chance for a full life. Grief is for what is now, what once was, what never was or never will be. Grief is connected to loss – not always obvious and not always immediate. Consider that when some part of your body is hurt, the pain signals you that, at the very least, it needs care and attention. Pain is a built-in alarm with the job to protect you and move you toward help and healing. Without it, you might further damage the hurt spot. If the issue is tended to, in time the pain will go away and many times complete healing can be restored. The good news is that, like pain, grief has purpose: Grief is one of the most important coping skills that God has given us. It’s a friend, not an enemy. It is emotional survival not giving into everlasting debilitating pain. Grieve well and you are more likely to attain healing. Ignore it or get stuck in it and the pain will intensify, impede life and bitterness will control you. The outcome of ‘good grieving” results in a more rich, wiser understanding of life. With emotional coping skills you will be stronger, happier and more sensitive and aware. Grief’s purpose is to move you beyond mere survival to growth. You are able to add value to the life you lead and the choices you make. You are able to empathize and reach out to others when they are in their own grieving. In our quick-fix society we tend to do one of two things: 1. shame ourselves for what we are feeling and put on a good face to others while we swallow our feelings and deny what’s really going on. or 2. We fill the empty space inside us with something that doesn’t fit. (i.e., drugs, alcohol, sleeping, eating, or compulsions like shopping.) The consequences for either of these options is the creation of impacted grief that adds to a growing mound of other unresolved grief issues that we have not dealt with. The fall-out of untended grief is to be controlled by that grief. Think about good grieving as a womb, an intentional safe, protected life-growing cocoon with the inhabitant moving through stages that will eventually bring about a new life. What begins as an embryo doesn’t merely sit protected just to leave the womb as an embryo. The initial embryo takes a journey through time and stages that knits sophisticated details and integrated systems together and finally is birthed as a marvelous life-form that is much more advanced and complete and capable than the original. How amazing is it that the first stage of grief is one of Shock/Denial! Oten, we cannot take the full throttle of the loss that has taken place and we need to mechanically move through the motions of the day to day. Even through tears and pain you will often hear a person say things like “I can’t believe this is real”. The reality was an experience of life consisting of sight, sound, feeling and touch that was like a part of you. Hope feels nonexistent. Questioning God is ok. He can take it! For many there is a stage of Bargaining. You send out unintelligible bargaining deals to the universe begging and demanding that this is not really what it seems to be and you will do it differently for that new chance. You make a “deal” to assure yourself that you are simply dreaming and will be relieved when you wake up and can change the incomprehensible outcome so that pain will leave and hope will return. At some point it all fades into Depression. Life packages all the denial and shock and anger and hopelessness now wrapped up in numbness. Concentration, energy, motivation, appetite, where you go and what you do don’t matter. Joy escapes you. Meaning to anything is difficult. Just getting out of bed is a meaningless chore. Action is not enjoyable, only a time-filler. Several things are important to know about this Womb of Grief. If you can learn about it when you are not in the depths of grief, you will be able to fortify yourself and deliberately make conscientious decisions about coping skills that you will use when you are in the darkness of that journey. If you are in the midst of it, you are still able to console yourself with better choices. Grief visits far longer than we want. Grief takes time and it’s never the timeline we want. It’s not hours or days or usually months. Often, it’s years. Grief is not nice neat stages, it is a roller coaster dizzily swaying back and forth, in and out of the stages. The stages are named for the primary distinction of that stage and not the sole distinction. For instance, you will find yourself moving in and out of shock and denial throughout each of the stages of the cycle. When you least expect it, another aspect of this roller coaster will smack the breath out of you. Grief is not simply dealing with one loss and then getting yourself ready for the next loss. Loss is not simple and clean. Our losses are complicated and is a prism of other losses that come to swim once again within each new loss. The new loss does not wait for one loss to “finish” before another comes barreling into your life. The course will last longer if you let yourself get stuck in one of the stages. Always allow yourself to feel the pain. Tomorrow will come. Be clear that your perceptions are skewered, your judgements clouded and your decisions are tainted by those perceptions. It’s ok to need comforting. An emotional wound is real and debilitating. Seek the emotional comfort of others who are able to offer it, not those who have not worked through their own issues. Music and journaling or painting are also great ways to let emotions out safely. Above all, embrace that there is a final stage! Acceptance. It’s a long and gradual stage but it is one that allows you to embrace bits of life and begin to feel other feelings again. Joy and hope and life peek through the tough days and begin to spread. You might even find that you feel guilty for feeling positive and hopeful. That’s ok. You go through all of this so that you can eventually embrace those positive feelings with more vibrancy. Remember that the point of this womb is to bring you to a more mature, more evolved appreciation for who you are and what is meaningful in life. You will have a greater capacity to embrace and celebrate your presence in this magnificent confusing World! And, you will be better equipped to move through the Womb of Grief or help someone else move through it when it is next needed. 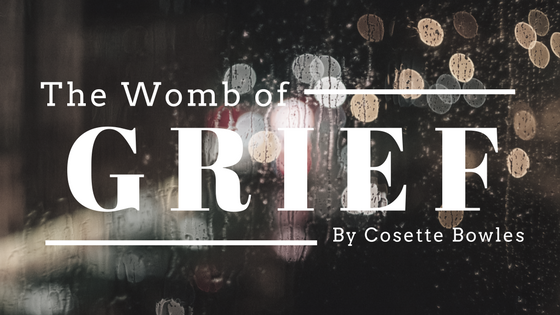 Great perspective on grief, the impact of what’s happened prior to and into the holidays, and how to grow through the grief cycle using the analogy of the womb and embryo! Thanks Cosette!